Macauley Bonne hit a hat trick as Leyton Orient served up scant consolation to Guiseley in a 4-1 victory that puts the O’s into second place in the National League. Guiseley were done up like kippers as Orient smashed four past Green in the Guiseley goal. In fact Guiseley were made to look green as Leyton Orient put in a wonderful display at Brisbane Road and were dominant in the last third of the pitch. Bonne’s hat trick was a lovely achievement and the icing on the cake was when Matt Harrold who had only been on the turf for four minutes drilled in a debut goal header to leave Guiseley third from bottom in the campaign. Eight games in and Orient are sitting pretty. All the parts are clicking into place nicely and even the most ardent of O’s fans would have bitten your arm off to be placed second after only 8 games of this new season. Incredibly this was the first time in 11 years that a home player had notched a treble for Orient at Brisbane Road in the league. However totally against the run of play Guiseley had taken the lead when Kayode Odejayi volleyed Guiseley ahead from a beauty of a Kevan Hurst cross. Sendles-White who has been sitting patiently on the subs bench the last few games even got to play and made his debut in the last ten minutes of the match, by which time the game was already as good as over as the Guiseley supporters streamed out of the ground early for the trip back up north. A healthy attendance of 4,323 saw Leyton Orient take the game to the Lions in the first half an hour without finding the net so it was a surprise when Guiseley opened the scoring after 36 minutes however two penalties in the 43rd and the second minute of added time in the first half propelled the O’s into the lead at the half time break. Both from Bonne. Orient made two changes from Monday’s win over Maidenhead and were without both Alex Lawless and Charlie Lee absent through injury. Manager Steve Davis’ presented a chance to youngster Henry Ochieng who took the offer with both hands. 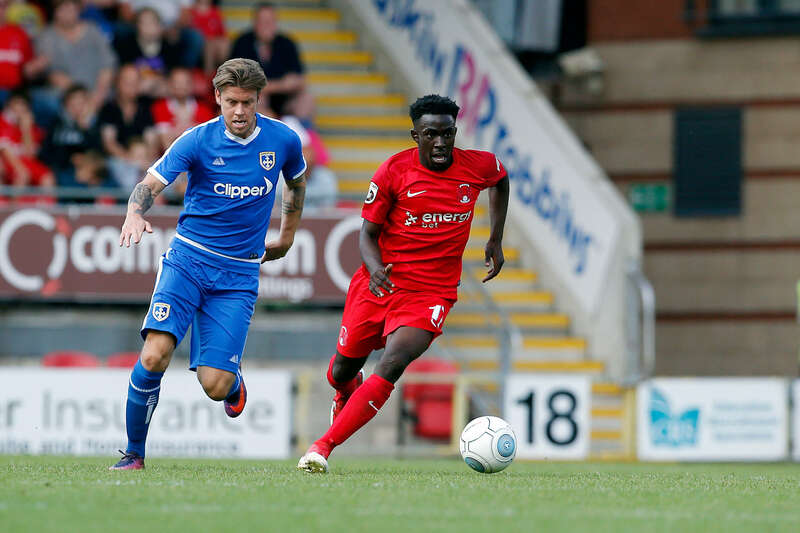 Craig Clay played with Ochieng in the middle of the pitch with David Mooney and Jobi McAnuff earning recalls as Josh Koroma dropped to the bench as a result. Myles Judd was among the substitutes for the first time this season. It turned into a brilliant day for Steve Davis and his Orient team as they made it four games without a defeat. New signing Matt Harrold was also listed as one of the replacements following his move on transfer deadline day and what an impact he made after coming onto the pitch just after the hour mark. Spare a though for poor Guiseley who were manager less after Adam Lockwood was sacked at the beginning of the week, so captain Danny Lowe helped pick the side along with various other figures at the club. By the end of the game in east London the sun was shining but Guiseley fans weren’t. The Orient fans were able to get a first glance of the new signing Harrold in an O’s shirt and they didn’t need long to see him celebrating. McAnuff’s impact was growing and he played in Joe Widdowson down the left, who crossed in for Harrold to power past Green from close range in the 65th minute. The O’s had made it 3-1 to give themselves some breathing space and their new striker had got off the mark in rapid time. Things were looking brighter and it wasn’t just because of the sun. Elokobi nearly got a fourth two minutes later, but he was denied by Guiseley’s goalkeeper from close range. The O’s supporters were on their feet again soon after, as the excellent Bonne grabbed the match ball as Harrold flicked in for Bonne to control and race past the last defender and shoot past Green. Bonne left the pitch to a standing ovation in the 84th minute and made a deserved meal of it. If Orient can serve up more of this type of result then a return to League 2 is nothing to be scoffed at.